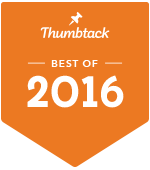 SparkleClean Maid Service has been awarded the Thumbtack "Best of 2016" award. This is the second year in a row. SparkleClean Maid Service uses www.Thumbtack.com to reach our potential customers quickly. Its a great way to compare quotes from us and our competitors. This is our signature deep clean so you can move with less worry. Charged by hour at $35 per maid, per hour. Please visit AngiesList.com/Review/2273968 in order to grade our quality of work and customer service. No job is too dirty for our team. We will capture drywall dust with micro filtration vacuum bags and microfiber cloths. Voila! Life is short – why spend your time cleaning? At SparkleClean Maid Service cleaning is our business. It's what we do (and we do a lot of it) and we're really good at it. So why spend your time cleaning? Maybe you could use the time to plant a garden or go for a hike? How about seeing a movie or just relax in a clean house curled up under a blanket. Doesn't that sound better? Top to bottom, giving your home a nice deep cleaning for a fresh start. It will be clean, look clean and smell clean, corner to corner.